Have you made Beef Stock 101? 1. Makes about 2 quarts Heat oven to 450 degrees. 2. Place bones in a roasting pan, and roast, 45 minutes, stirring occasionally. 3. Add onions, garlic, carrots, and celery to roasting pan. 4. Return to oven until well browned, roasting for a total of 1 to 1 1/2 hours. 5. Remove roasting pan from oven, and transfer bones and vegetables to large stockpot; discard any fat. 6. Heat roasting pan on stove over high heat. Add wine to deglaze, stirring to loosen any browned bits from bottom of pan. 7. Transfer to stockpot, and add bouquet garni, tying to handle of pot for easy removal. 8. Add enough cold water to cover by 2 inches. Bring to a boil and reduce to simmer. 9. Cook for 7 to 8 hours, skimming frequently. 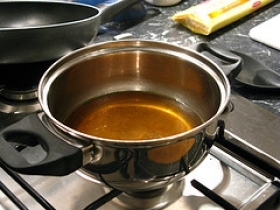 Strain the stock through a chinois or fine sieve into a large bowl or pot, and set the bowl in an ice bath. 10. When cool, cover and refrigerate overnight. 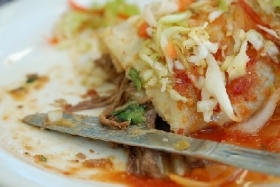 Remove layer of fat from bowl or pot. 11. 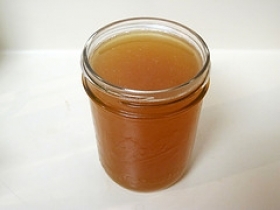 Stock can be stored in refrigerator for 3 days and frozen for up to 3 months. 12. The French word for stock, fond, translates literally as "foundation. 13. " And it's a fact that stock is the foundation upon which to build a fine soup, sauce, or stew. 14. Slow-simmered bones, vegetables, and herbs are the key elements in a successful stock. 15. With each passing hour, they give more of themselves to the final product. 16. 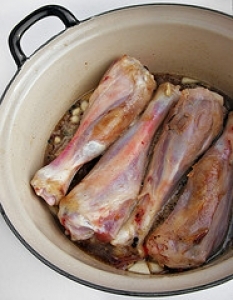 Raw beef bones with some meat--such as shanks, necks, and shins--are good choices for stock. 17. Add richness and color to the stock by browning the bones and vegetables in the oven before simmering. 18. 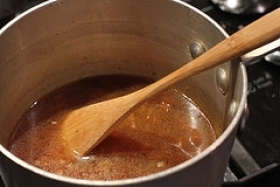 After roasting, scrape the pan well and add the scrapings to the stock pot. 19. Then deglaze the roasting pan with red wine and add the deglazing liquid to the pot. 20. Moderately seasoning a stock with herbs and pepper enhances the flavor of the final dish. 21. But use whole peppercorns rather than ground pepper, which can turn bitter after prolonged cooking. 22. Most chefs avoid adding salt to a stock--it may become too salty as it reduces. 23. To keep stock clear, remember to simmer rather than boil, and frequently skim away any foam that rises to the top during cooking. 24. Clarify the stock by straining it through a chinois, a conical metal sieve with an extremely fine mesh, and chill the strained stock until remaining fat solidifies on the surface. 25. For perfectly strained stock, pour it through a sieve lined with frozen cheesecloth. 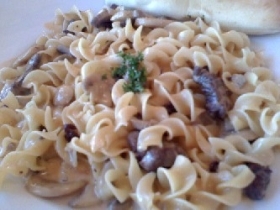 This recipe contains potential food allergens and will effect people with Sulfites, Garlic, Alcohol, Celery, Onion allergies.